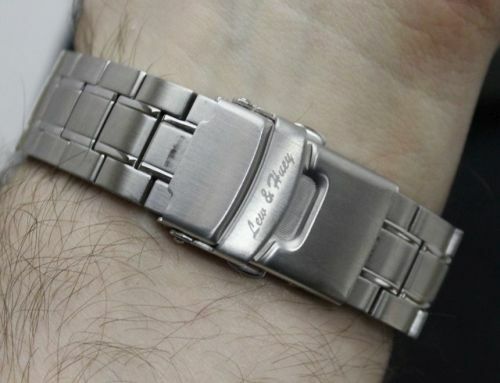 For anyone who spends any amount of time checking out the watch projects on the various crowd-funded sites, you’re not doubt familiar with the Lew & Huey brand, which started up in 2012. They just wrapped up funding one of their latest models, the Acionna, and they’ve sent over one of their prototypes for us to spend some time with. 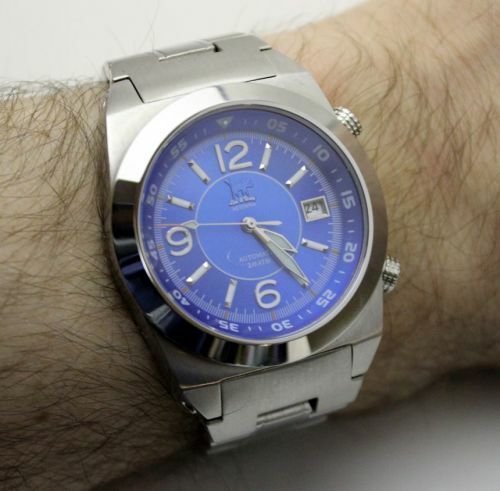 Read on to get our hands-on take on this new watch. What struck me first about the Acionna was the case shape. With it’s squared-off lug shape, and the solid end links, it ends up presenting as a much beefier size than it’s 40mm diameter would suggest (to be fair, it is marked as 48mm lug-to-lug). I think this is primarily due to the way the end links visually extend the case; swapping to the included leather strap should diminish this, if it’s of concern to you. Past that, the case styling also gives things a touch of a vintage sport watch, to my eye. While I’m not well-versed enough in that era of watches, I know this shape is reminiscent of something I’ve seen previously. Suffice to say, this is a watch that easily classifiable as a sport piece. Given the two-tone palette our sample had (blue and silver, with the tiniest hint of orange on the seconds hand and at the indices) and polished surfaces, Lew & Huey’s assertion that the piece can function in dressier environments passes muster. No, I probably wouldn’t pair the watch with a tux, but if you’re throwing on a sport coat for a night out, I don’t think the Acionna would look out of place. Once you get past the case, I found myself checking out the dial. As you might expect from something that’s shooting for a sport style, legibility and luminosity of the dial is quite nice. You’ve got large numerals (almost aviation-style, you could say) showing up at three of the four cardinal points; where those aren’t, you’ve got large indices. 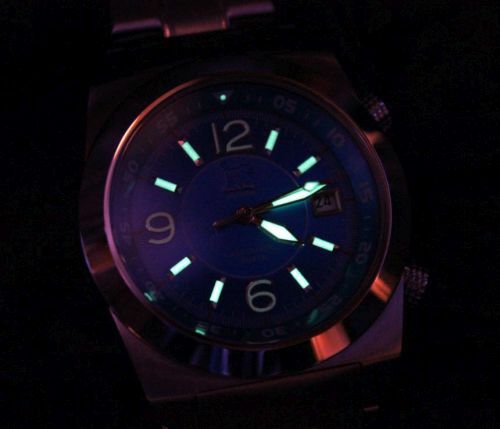 Those indices, rather than just being layers of lume, are actually hollow tubes that are filled with luminous paint. This allows for a nice, bright glow, while giving some dimensionality to the dial. You also pick up some subtle dimensionality to the dial around it’s outer edge, where there are concentric grooves radiating from the hour track to the outer edge. In some lighting, this can make the outer edge look to pick up a slightly different color than the dial center, but that’s just how the light catches things. I like it, as a flat (plain) expanse of a dial can get boring in a hurry, especially if it’s glossier, as we have in the center of the Acionna. Spinning on top of that dial you’ve got sword-style hands, which are also luminous, and a slender seconds hand that also has a luminous fill on its tip. Along with indicating the main time, these hands can be used to time an event with the internal bezel on the watch. These are an interesting twist on a standard bezel layout, if you’ve not played with one before. Here, the crown at 2 o’clock controls the setting of the bezel. 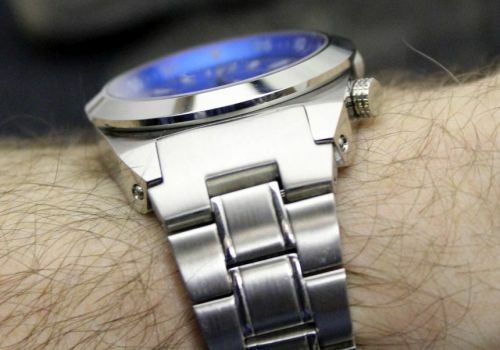 On our prototype, this was a non-disengaging crown, which meant you could freely rotate the bezel at any time, potentially throwing off the timing. On the production model, this will be changed over to a 120-click bezel (something I’ve not seen on an internal setup before) which should help prevent accidental resets. There are two other changes from our prototype to what you’ll see in production. The crown at 4 o’clock is used to adjust the date and time, as well as winding the movement, and was just a simple pull-out style. 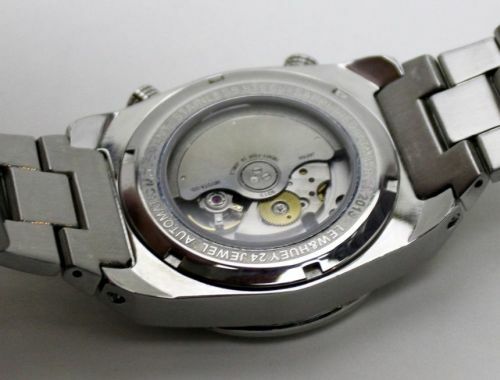 In the production model, this will be changed to a screw-down crown, which you might expect for a watch rated to 200m. The final (big) change deals with the date wheel. If you’ll notice in the pictures, this is not quite aligned properly to the window. These were one-offs for the prototype, so alignment wasn’t quite right yet. In the production model, you can rest assured that these will align properly. For the time I spent with the watch, if I hadn’t known it was a prototype, I may not have actually called it one (well, aside from that date wheel issue, that’s a pretty noticeable item). Though Lew & Huey will be working to improve the fit and finish, the one we had in for review seemed like it had a pretty well-sorted assembly done on it. 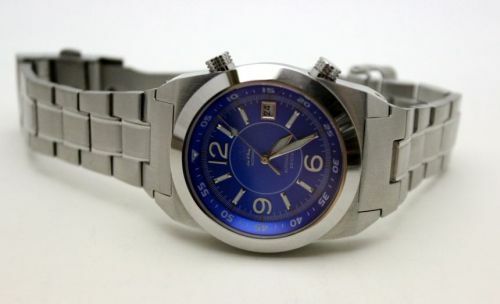 I also found the piece to be fairly comfortable (then again, I’m used to larger steel watches). Fortunately for me, the sample came in sized just about right for my wrist. For anyone purchasing one, sizing shouldn’t been an issue either – they’re building the bracelet so that it’s adjustable as small as 6″, or as large as 9″. So, yeah, on the bracelet, it’s going to fit just about anyone (the leather strap will have a little less adjustability, I imagine).